Functional ankle instability (FAI) is defined by a subjective feeling of “giving way” and/or recurrent ankle sprains due to sensorimotor deficits.1 Clinicians are challenged to develop rehabilitation protocols that can adequately decrease symptoms of giving way and, more important, prevent recurrent ankle sprains. Developing proper rehabilitation protocols requires correct assessment of existing sensorimotor impairments associated with FAI. Balance tests, which provide indirect feedback on the sensorimotor system, are commonly used to assess postural stability in individuals with FAI. Sensorimotor deficiencies associated with FAI may impair balance because controlling posture requires the integration of detectable afferent signals from the sensory organization system to produce efferent motor responses. For example, muscle spindles will detect stretching of the posterior leg muscles during anterior sway. These afferent stretch signals are transmitted to the central nervous system and synapse with alpha motor neurons to produce reflexive efferent motor responses of posterior muscles to right the body. Thus, the failure of afferent nerves to detect or transmit information about excessive sway may result in impaired balance. 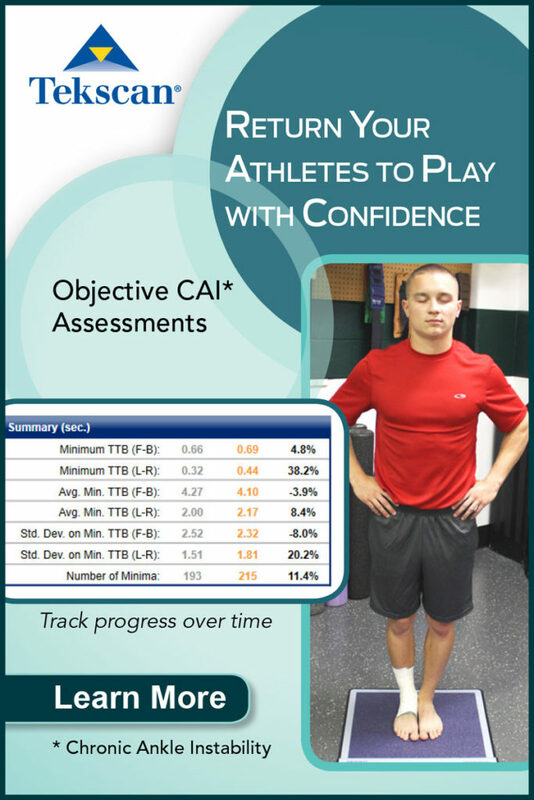 While some literature reviews have suggested that balance impairments are not consistently associated with FAI,2,3 our recent meta-analysis contradicts these findings and indicates that balance impairments actually do exist with FAI.4 We believe, therefore, that clinicians should include balance assessments in their evaluation of FAI. Identifying balance deficits associated with FAI may help clinicians design proper rehabilitation protocols to decrease symptoms of giving way and prevent recurrent ankle sprains. The variability among tests, modes, and outcome measures may be reasons why some researchers have reported balance deficits with FAI and others have not reported impairments. In addition, researchers conducting systematic reviews have reported inconclusive results in detecting balance deficits associated with FAI because subject samples for each study reviewed may have been too small to detect balance impairments.2,3 Our recent meta-analysis addressed this latter issue because we found balance deficits associated with FAI when we combined the results of studies with small samples.4 To this end, we also determined in our meta-analysis that certain outcome measures were indeed better than others at detecting balance impairments associated with FAI.4 This underscores the importance of recognizing tests, modes, and outcome measures that can be used to accurately identify single leg balance deficits associated with FAI. This review considers static clinical balance tests and balance tests on force plates that can be used to detect balance deficits associated with FAI. We define static single leg balance as balancing without intentional movement. We first discuss modes and outcome measures for clinical balance tests. Second, we provide recommendations regarding the modes that should be used to assess balance on force plates. Third, we recommend force plate outcome measures for detecting balance impairments. The information outlined in this review will allow clinicians to make informed decisions regarding the appropriate assessments for detecting balance deficits. During these clinical balance tests, poor balance is indicated by greater frequency of foot touches to the floor with the non-weight-bearing leg or greater sway of the upper body.16,17 The number of foot touches is an objective outcome measure, but sway of the upper body is not. Sway of the upper body requires clinicians’ judgment, and clinicians may be biased to what they know or what they expect during balance tests. Consequently, clinicians need to consider using objective outcome measures with clinical balance testing to eliminate subjectivity and bias. The FLT stance position is somewhat different from traditional single-leg tests because individuals are required to touch their non-weight-bearing foot to the weight-bearing leg at calf level, with the arms relaxed at the sides.9 (Traditionally, the non-weight-bearing leg and weight-bearing leg do not touch during single leg tests.) Individuals are required to balance with eyes closed, stand on a bare foot, and remain as motionless as possible without moving their arms or non-weight-bearing leg. We recently found in our meta-analysis that the FLT outperformed other clinical balance outcome measures, as well as force plate outcome measures, in identifying balance deficits (Figure 1).4 Currently, however, no cutoff score has been published to identify balance deficits associated with FAI. Table 1 reports mean scores for individuals with and without FAI. Patients with FAI score approximately 10 points greater than those individuals without FAI.9 Based on this information, we believe that clinicians should strongly consider using this test to assess balance deficits associated with FAI. The TBT is a clinical test used to assess the length of time individuals can balance.6 This test is performed on a single leg without shoes or socks on the foot. From the description provided in the literature, it is unclear whether the test was intended to be performed with the hands on the hips or crossed over the chest. Based on our preliminary work with this test, however, we recommend placing hands on the hips. The test is performed with and without vision (three trials with eyes open and three trials with eyes closed). Patients are required to remain as motionless as possible in a single leg stance for 60 seconds. However, testing may stop before 60 seconds have elapsed if a loss of balance occurs, defined as movement of the weight-bearing foot or touching of the foot of the non-weight-bearing leg to the ground. The best times for each vision condition are used for balance analysis, and balance deficits are identified in patients with FAI by a shorter time balancing than individuals without FAI. Researchers have reported lower TBT results for patients with FAI than for individuals without FAI (Table 1).6 No cutoff score currently exists to identify balance deficits associated with FAI, however. 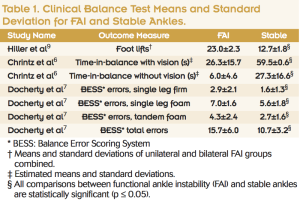 Table 1 reports the mean time-in-balance for individuals with and without FAI. On average, patients with FAI spend 21.3 seconds and 33.2 seconds less time-in-balance with their eyes closed and open, respectively, than do individuals without FAI.6 We recently found in our meta-analysis that the TBT outperformed other clinical balance (except FLT) and force plate outcome measures in identifying balance deficits (Figure 1).4 Thus, we believe that clinicians should consider using this test to assess balance deficits associated with FAI. The BESS is a clinical test that quantifies balance deficits using three stance conditions and two surface conditions.7 The three stance conditions are double leg, single leg, and tandem stances. The surface conditions include firm and unstable (medium-density foam) surfaces. All stance conditions are performed without vision, barefoot, and with the hands on the hips. This test requires individuals to remain as motionless as possible for 20 seconds for each stance condition, while minimizing the number of balance errors. touching the non-weight-bearing foot to the ground. Errors committed simultaneously are counted as one error. For example, an individual might touch a foot to the ground and open the eyes at the same time; although two errors were committed, both happened at approximately the same time and should be counted as one error. Each stance condition has an error score, and a total error score for all conditions is calculated at the completion of testing. 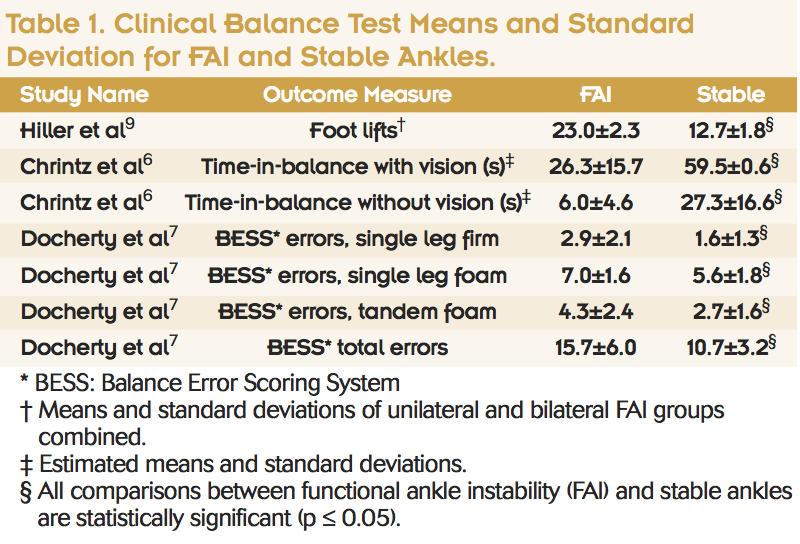 The BESS has been recommended as a useful clinical balance assessment because of its ability to detect balance deficits associated with FAI.7 More specifically, individuals with FAI have been found to commit more errors during single leg stance on firm and foam surfaces and during tandem stance on foam surface, and they have greater total error scores than subjects with stable ankles (Table 1).7 In our meta-analysis, we found that the BESS single leg stance-firm condition performed as well as most force plate measures in detecting balance deficits associated with FAI.4 Like the aforementioned tests, no cutoff score is available to identify balance deficits associated with FAI. Table 1 reports the mean error scores for individuals with and without FAI. On average, patients with FAI commit 1.3 more errors than individuals without FAI during single leg balance on firm surface.7 While this test does not perform as well as the FLT or TBT, we still recommend that clinicians consider the single leg stance firm condition of this test for assessing balance deficits (Figure 1). Although we focused our review on single leg stance on firm surfaces, clinicians may also elect to use error scores associated with the full test battery, single leg stance on foam surface, or tandem stance on foam surface. Clinicians can obtain additional objective information on small changes in balance by examining single leg stance on a force plate. A number of clinical force plates are available to clinicians, and the software associated with these force plates is user-friendly and provides center-of-pressure (COP) outcome measures. Clinicians who do not have access to force plates may consider budgeting for one; the cost is similar to other therapeutic and evaluation equipment used in clinics, such as isokinetic dynamometers, electrical stimulation/ultrasound units, and treadmills. Clinicians need to choose force plate outcome measures that are accurate in detecting balance impairments associated with FAI. 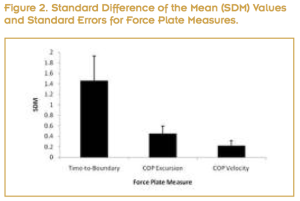 Our meta-analysis indicated that force plate measures using time-to-boundary, velocity, or excursion measures identify balance deficits associated with FAI (Figure 2).4 Excursion COP measures examine average or maximum displacement of data points from a centered position. 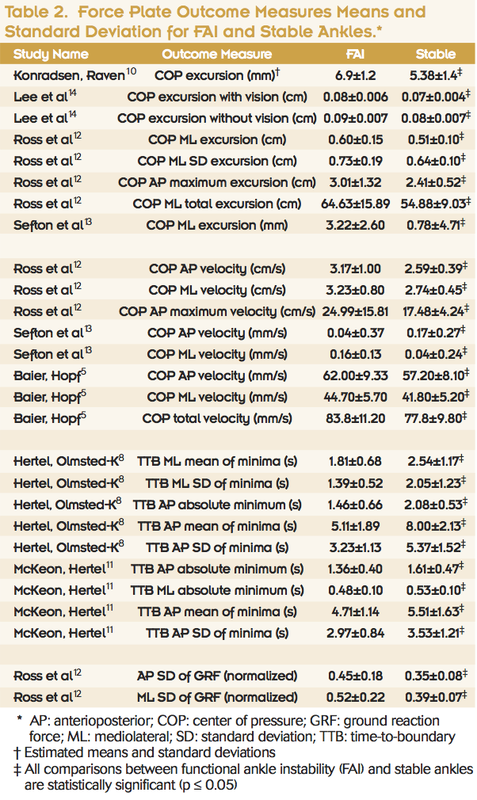 COP velocity measures examine displacement of data points per unit of time. Greater values associated with excursion or velocity indicate an inability to control posture during single leg balancing. Time-to-boundary measures examine the amount of time it would take a COP data point to reach the boundary of the base of support if this data point were to continue to move at a constant velocity. Balance deficits are identified with shorter times for a data point to reach a boundary of the foot. The Time-to-Boundary measure outperformed center-of-pressure (COP) excursion and velocity in detecting balance deficits associated with FAI. 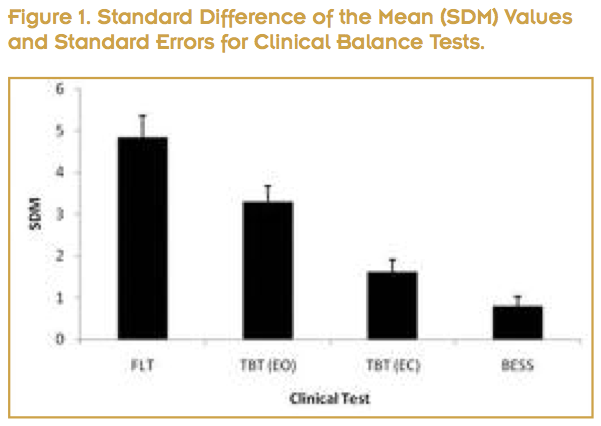 The SDM values associated with Time-to-Boundary, COP excursion, and COP velocity indicate that these measures are useful for detecting balance deficits. The SDM indicates the degree of difference between FAI and stable ankles, and greater SDM represents greater ability for a test to detect balance deficits. We believe that clinicians should concentrate on COP velocity or excursion outcome measures because these measures are usually outputs on clinically available software. Time-to-boundary and standard deviation of the GRF have outperformed several COP measures,8,12 but they are not outputs on most clinical software. This omission is why we have not recommended these measures as outcome assessments. Clinicians may consider using time-to-boundary and standard deviation of the GRF if they have the means to calculate these outcome measures. Clinicians can consider using a combination of balance assessments and outcomes measures to detect balance deficits associated with FAI. Clinically, the FLT outperforms all other clinical balance tests and should be included in balance evaluations. Other clinical tests such as the TBT or BESS can provide additional quantitative information on balance. Force plate measures can provide assessments for small yet significant changes in balance. Force plate measures that assess time-to-boundary, velocity, or excursion have the greatest ability to detect balance impairments. Clinicians can use three clinical balance tests (FLT, TBT, BESS) and several force plate measures (time-to-boundary, velocity, or excursion) to identify balance deficits associated with FAI. Scott E. Ross, PhD, ATC, is an associate professor in the department of health and human performance at Virginia Commonwealth University in Richmond. Shelley W. Linens, PhD, ATC, is adjunct faculty and Brent L. Arnold, PhD, ATC, is an associate professor in the same department. 1. Tropp H. Commentary: Functional ankle instability revisited. J Athl Train 2002;37(4):512-515. 2. McKeon PO, Hertel J. Systematic review of postural control and lateral ankle instability, part 1: Can deficits be detected with instrumented testing? J Athl Train 2008;43(3):293-304. 3. Riemann B. Is there a link between chronic ankle instability and postural instability? J Athl Train 2002;37(4):386-393. 4. Arnold BL, de la Motte S, Linens S, Ross SE. Ankle instability is associated with balance impairments: A meta-analysis. Med Sci Sports Exerc 2009;41(5):1048-1062. 5. Baier M, Hopf T. Ankle orthoses effect on single-limb standing balance in athletes with functional ankle instability. Arch Phys Med Rehabil 1998;79(8):939-944. 6. Chrintz H, Falster O, Roed J. Single-leg postural equilibrium test. Scand J Med Sci Sports 1991;1(4):244-246. 7. Docherty CL, Valovich McLeod TC, Shultz SJ. Postural control deficits in participants with functional ankle instability as measured by the balance error scoring system. Clin J Sport Med 2006;16(3):203-208. 8. Hertel J, Olmsted-Kramer LC. Deficits in time-to-boundary measures of postural control with chronic ankle instability. Gait Posture 2007;25(1):33-39. 9. Hiller CE, Refshauge KM, Herbert RD, Kilbreath SL. Balance and recovery from a perturbation are impaired in people with functional ankle instability. Clin J Sport Med 2007;17(4):269-275. 10. Konradsen L, Ravn JB. Prolonged peroneal reaction time in ankle instability. Int J Sports Med 1991;12(3):290-292. 11. McKeon PO, Hertel J. Spatiotemporal postural control deficits are present in those with chronic ankle instability. BMC Musculoskelet Disord 2008;9:76. 12. Ross SE, Guskiewicz KM, Gross MT, Yu B. Balance measures for discriminating between functionally unstable and stable ankles. Med Sci Sports Exerc 2009;41(2):399-407. 13. Sefton JM, Hicks-Little CA, Hubbard TJ, et al. Sensorimotor function as a predictor of chronic ankle instability. 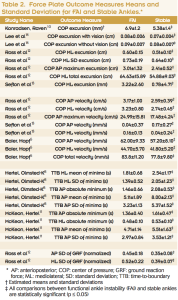 Clin Biomech 2009;24(5):451-458. 14. Lee AJY, Lin WH, Huang CH. Impaired proprioception and poor static postural control in subjects with functional instability of the ankle. J Exerc Sci Fit 2006;4(2):117-125. 15. Trojian TH, McKeag DB. Single leg balance test to identify risk of ankle sprains. Br J Sports Med 2006;40(7):610-613. 16. Freeman MA. Instability of the foot after injuries to the lateral ligament of the ankle. J Bone Joint Surg Br 1965;47(4):669-677. 17. Garn SN, Newton RA. Kinesthetic awareness in subjects with multiple ankle sprains. Phys Ther 1988;68(11):1667-1671. 18. Riemann BL, Guskiewicz KM, Shields EW. Relationship between clinical and forceplate measures of postural stability. J Sport Rehab 1999;8:71-82. 19. Ross SE, Guskiewicz KM. Examination of static and dynamic postural stability in individuals with functionally stable and unstable ankles. Clin J Sport Med 2004;14(6):332-338.